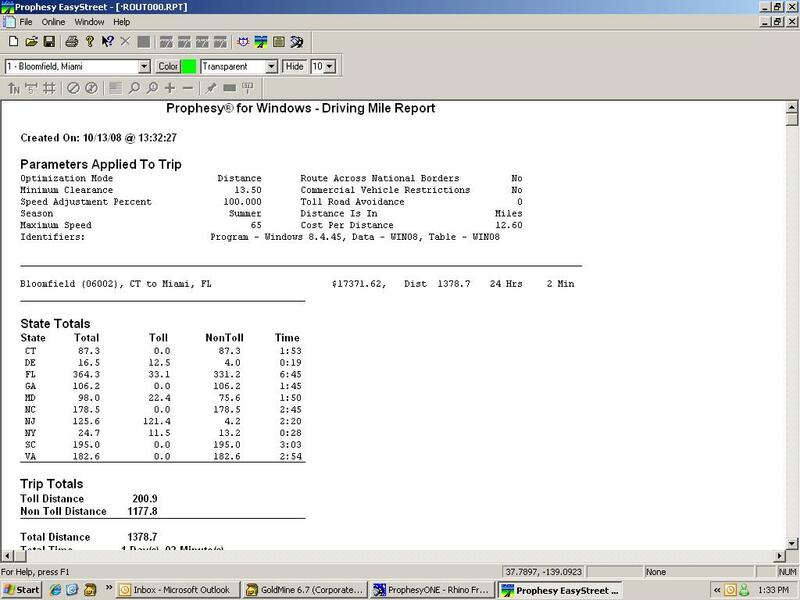 Prophesy Mileage & Routing is the easy-to-use, commercial-grade mileage and routing system you will have up and running in less than five minutes. You’ll immediately find yourself using it to automate complex tasks such as looking up mileage and quoting rates over the telephone, optimizing multiple stop trips, and routing between cities, intersections, truckstops, and zip codes. Prophesy offers a comprehensive system that can route to more than 1,000,000 points in North America, and can calculate both industry standard rating and practical miles. The program also integrates with our dispatch and accounting, fuel tax reporting, log auditing and fuel purchase optimization applications. Generate the most efficient route complete with detailed driving instructions in seconds! Account for bridge heights, low underpass and commercial vehicle restrictions, seasonal road closures, toll road avoidance, and speed limits. Allow unlimited mileage look-ups without any transaction fees! Provide you with detailed full-color mapping, including optional street-level detail. A menu at the top of each screen gives you easy access to any information with a click of a button. Detailed driving directions with mileage and exit information. Total time and distance for each leg of the trip is easily viewed here. A bold line clearly shows the optimal route.